This Saturday at 6pm ET, Hall of Fire will be looking at moral dilemnas as we examine our next chapter of The Return of the King — the Pyre of Denethor. Fearing Denethor is about to act rashly, Pippin has sought out Gandalf at the Great Gate of Minas Tirith. As the battle teeters and rages without, Gandalf faces a desperate choice: leave his key foe the run of the field and face down Gondor’s Steward or abandon the ill and helpless Faramir to the vicissitudes of luck. Meanwhile in Rath Dínen, Beregond fights Denethor’s servants to a standstill over the life of Faramir. How has the use of the Palantir poisoned the Steward’s mind? How does Gandalf try to win Denethor back to reality? What do you think about Denethor’s end? Loyalty to and obedience of authority are key virtues in The Lord of the Rings. Yet in this chapter Tolkien examines the price of uncritical obedience. How do you compare Beregond’s acts with those of Denethor’s personal servants? And what about the murder of the porter, can that be justified? These are just a few of the questions we’ll ponder this weekend as we explore The Pyre of Denethor in the Hall of Fire. 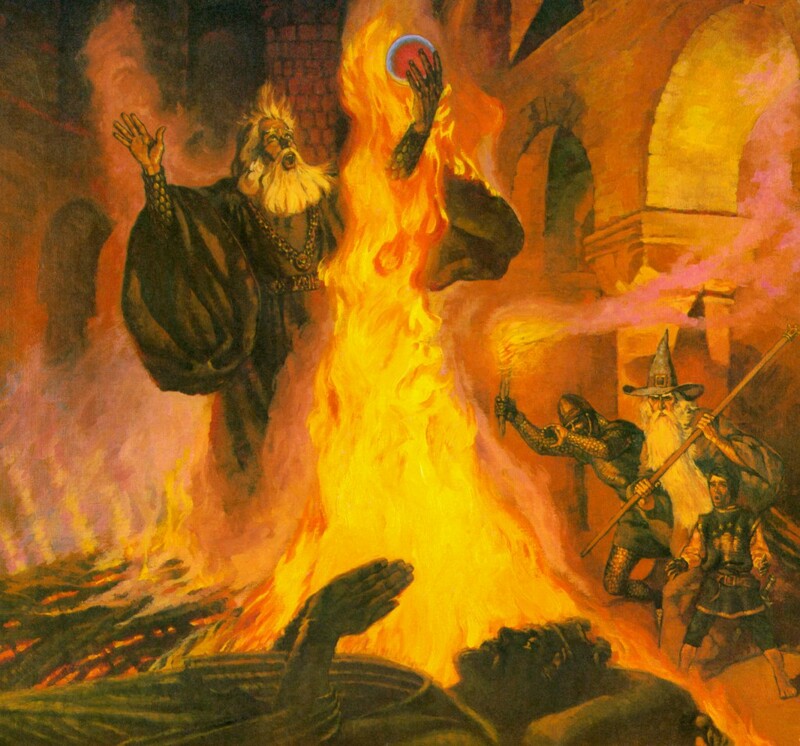 The Pyre of Denethor by Robert Chronister.